Read more about the latest Food Garden News. View the OLC Food Garden Program – Lesson & Activity Schedule. View a gallery of photos from the OLC Food Garden. Our Lady of the Cape Primary School’s Food Garden was the initiative of the P & F. The idea gained support from the school community and a busy bee was organised to install the garden in September 2009. 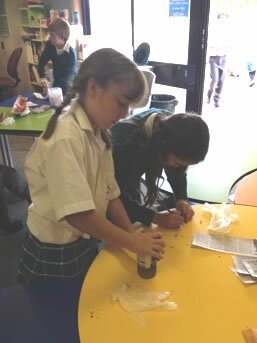 A School Food Garden Committee was formed consisting of 11 parent volunteers (including a Food Garden Co-Ordinator). A Food Garden program was soon initiated and since then thanks to the support of volunteer parents, and teaching staff, the program remains strong. This School Food Garden Committee is now known as Friends of the OLC Food Garden. 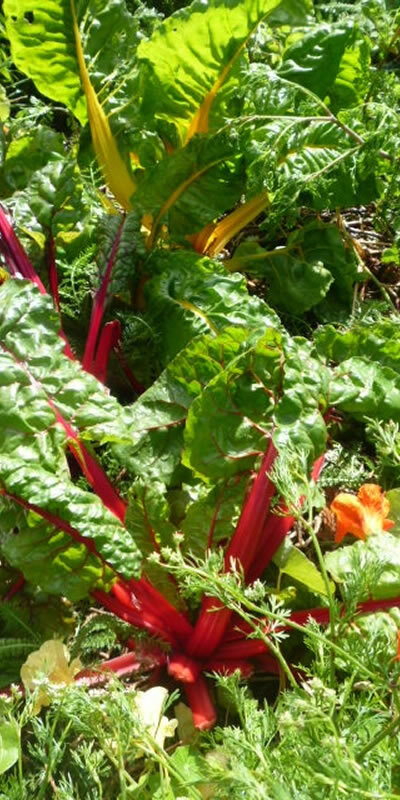 The food garden program is currently sponsored by a local business (Dunsborough Mitre 10). 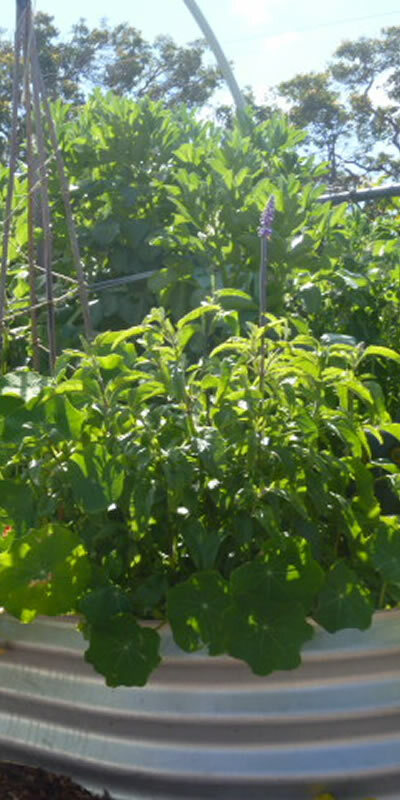 The food garden is maintained organically using various organic methods including Integrated Pest Management as well as Permaculture principles. In addition to conventionally produced seeds and seedlings, the school also uses heritage seeds and seedlings so that students can learn about biodiversity and seed saving. Vegetable stalls are held subject to the availability of garden produce. The funds received from the sale of the garden produce go directly to the P & F to cover garden costs as well as funding other important school projects. All students currently take part in this program at different times throughout the year. In addition to the lessons that have been created as part of the Food Garden Program, linked directly to the school’s curriculum, we also run other programs alongside, such as Growing Food for the Community (Year 6) and Adopt-A-Veggie Program 4 Kids (Kindy to Year 2). There are a number of ways you can become more involved with the School’s Food Garden. 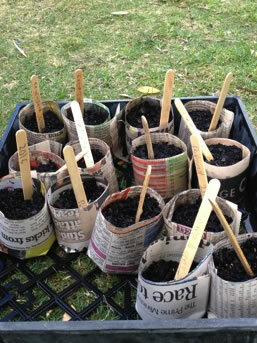 If you can assist with this important project please contact the Food Garden Co-Ordinator (Alisa Allison) on 0448 567 369. 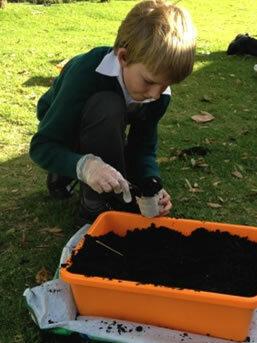 To ensure the success of the school’s food garden, volunteers are needed for a roster system to maintain the garden by carrying out various garden tasks. You can be included in the roster system for each term (approx 1 week per term). During the week duties may include liquid fertilising, weeding, pest control, planting seedlings etc (total time allowed approx 1- 1 1⁄2 hours per week). The weekly tasks can be completed at a time convenient to you. You do not have to have green fingers to be included in this roster, the only prerequisites are a passion for the project and willingness to learn. We are constantly on the look out for items needed in the school’s food garden. If you have any items that you think may be suitable for the garden and you no longer need, please consider donating these items to the food garden. Items such as tools, plant pots, buckets, ice cream containers, wooden popsticks, organic manure, seedlings, seeds etc. To donate simply leave next to the garden shed which is located behind the school shed in the overflow car park or contact the Food Garden Co-Ordinator (Alisa Allison) on 0448 567 369. Parent support is greatly appreciated to ensure the smooth running of the Food Garden Program. Parent help will be requested throughout the year to assist Class Teachers with any garden lessons or activities. 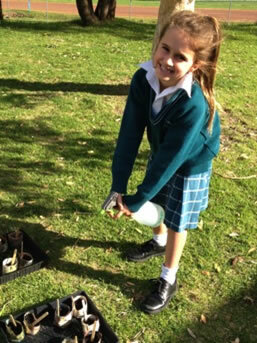 Our Lady of the Cape Primary School takes a ‘hands on’ approach to reducing their school’s eco footprint. Students ensure that the food scraps from both Pre-primary classes and the school’s canteen are taken to compost bins regularly throughout the week. The school’s compost system uses the two-bin method whereby one bin is filled using layers of wet and dry materials until the bin is full. Once this bin is full, it is left untouched for a few months being turned occasionally. The empty compost bin then becomes the new ‘active’ compost bin and the layering process beings again. The finished compost is used to further enrich the soil in the school’s food garden. This project is being run in conjunction with another waste wise project taking place at the school. The Year 1’s and 2’s are responsible for feeding the worms in the school’s worm farm, using food scraps from both kindy classes. Composting is nature’s way of recycling. Compost is the byproduct of the composting process being made up of decomposed organic material, such as kitchen waste, plant remains, grass clippings, straw, paper and animal manure. This process is made possible with the help of naturally occurring bacteria, fungi and small creatures such as earthworms, slaters and millipedes. Using compost in the home or school garden has many benefits. Here are just a few. Improves the water holding capacity of the soil, reducing the need to water as often, as well as reduce your water bill. Increases plant resistance to pests and diseases. Improves the flavour and nutrition value of fruit and vegetables. Improves soil structure for increased crop yields. Saves money as no need to outsource soil improvers. 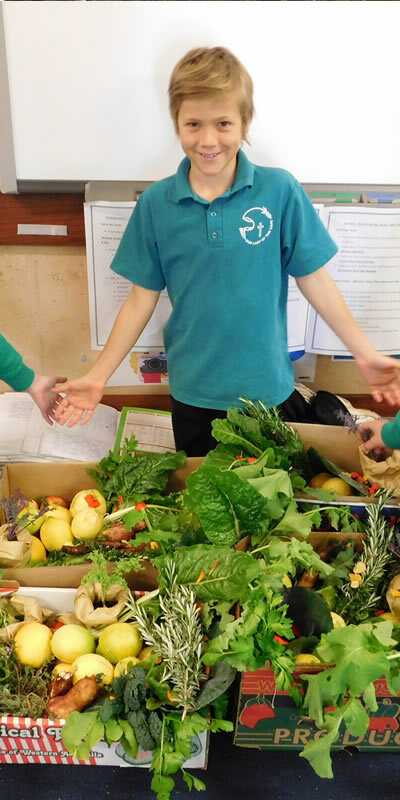 In Western Australia, 13% of an average schools’ waste is made up of food waste. By school’s taking part in composting, this food waste can be diverted from landfill and turned into a useable product for the garden. This has a significant effect on reducing the amount of greenhouse gas emissions from landfills, with 90% of these emissions being the result of decomposing organic material. For more information on composting please visit the following websites.